This week I take a look at different ways to carbonate your home brewed beer. Carbonation is an important feature of beer – it adds moutfeel, perceived body, and heavily influences the way that hop and malt aromas are delivered to your nose. It is also critical to the beer’s appearance and head retention. Not all beer is carbonated to the same level. At one extreme we have real English ales that are served with almost no added carbonation. At the other extreme we have beers like the German Weizen that are so highly carbonated that the glass is often poured in stages to give it time to settle before more beer is added. Carbonation levels are expressed in volumes of CO2. One volume of CO2 (which is unitless) is a given volume of gas dissolved into the same volume of liquid. So 1 volume would be a liter of CO2 dissolved in a liter of beer, or a gallon of CO2 dissolved in a gallon of beer. Most beers are served somewhere in the 2-3 volume carbonation level, though there are a few exceptions that fall outside of those bounds. We often adjust the carbonation level in our beer to match the style of beer we are brewing. Most brewers start by bottling. While all of the cleaning, bottling and capping can be a chore, it is nice to be able to give away a six pack to a friend or take a few bottles to a party. There are a wide variety of methods you can use to carbonate your beer when bottling. All of these are added after fermentation and just before you bottle your beer. Corn Sugar/Table Sugar – Mix a pre-measured amount of sugar, and add it to your beer just before bottling. In most cases we’ll dissolve it in a bit of distilled water and mix the entire amount into our beer in a separate bottling bucket before we bottle the beer. Dry Malt Extract (DME) – For those who don’t want any sugar in their beer you can use DME instead. Malt extract can be used in the same way as sugar, but obviously you require a bit more DME than sugar to get a given carbonation level. Krausening – In this method we actually use fresh wort to carbonate the beer. This is similar to the DME method, but the calculation of the amount of wort to use is a bit more complex. I provide a simplified version of the krausening equation here. Carbonation Tablets – A number of brewing shops sell carbonation tablets which are simply small sugar or dextrose tablets that you add directly to the bottle when bottling. Typically they are sized for 12 oz bottles. These are very easy to use, but they make it difficult to customize your carbonation level and also don’t work well if you have a mix of different bottle sizes. Kegs offer some significant advantages over bottles. Not only does pulling your beer from your own tap have a “cool factor” to it, but cleaning and filling kegs takes only a fraction of the time it would take to bottle the same amount of beer. You also have a variety of ways to carbonate your keg. 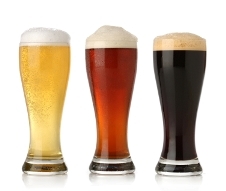 Forced Carbonation – By far the most common carbonation method for kegs is forced carbonation. In this method you simply refrigerate the keg and then apply CO2 pressure to it. Over a few days, the CO2 will permeate the beer and carbonate it fully. Also you can easily control the carbonation level by adjusting the CO2 pressure up or down. I run my kegs at around 13 psi (90 kpa) but your system may vary. Natural Keg Carbonation – While not used often anymore, you can treat your keg like a big bottle and simply add sugar/DME or wort, just as we did in the bottling section above, to naturally carbonate beer. This is how kegs were carbonated before we had bottled CO2 and widespread refrigeration, but it is still used with some classic real ales. Typically the amount of sugar needed to carbonate a keg is lower (often by 40-50%) than the equivalent needed for bottling to account for reduced headspace and slightly better fermentation in the larger vessel. As I mentioned above, you typically choose a target carbonation level, expressed in volumes, before you carbonate your beer. If you don’t know where to start, a level of around 2.4-2.6 is typical for an American ale. For bottling, you can use the carbonation tool or integrated calculator within a recipe in BeerSmith to estimate the amount of sugar or DME needed. For kegging, BeerSmith will also calculate the pressure level needed to achieve a given carbonation level. There are a number of online tools and spreadsheets that can do the same thing. When using the bottling calculation, you need to enter the temperature of the beer at bottling time (which is often room temperature) as this is used to calculate the amount of residual CO2 left in the beer from fermentation. For kegging, however, we use the keg storage temperature which is typically the temperature of your keg refrigerator as the basis since this is the temperature you’ll be using when you carbonate and serve your keg. This was a brief overview of carbonation options – if you have your own tip please leave it below! Thanks for joining me on the BeerSmith Home Brewing Blog. Be sure to sign up for my newsletter or my podcast (also on itunes…and youtube…and streaming radio station) for more great tips on homebrewing. Also check out the How to Brew Video series I shot with John Palmer if you want to learn more about all grain brewing. How many days should I forced carbonation. I already forced my kegs for bottling at 14 PSI and then shake them for about 10 minutes, I saw this recommendation in a Denny Conn book and my beer its full carbonated but without head retention, it’s very weird. The other thing what do you think If a forced at 30 PSI for one day and then at 13 PSI for 2 more days. my name ashenafi mekonnen from Ethiopia , i need ur help seriously please! i am trying to produce homebrew not realy for home but for business around my city .. at the moment i have tried to produce beer but unable to make my beer more carbonated so even i don’t have equipment which need for this ….., what can u advise me and what can u help me? Typically you carbonate it by either bottling it with a small amount of sugar (which the yeast will eat and produce CO2) or by kegging it under CO2 pressure.